Breakfast at the hotel, and then on the road again, heading south for Pondicherry, which was ruled by the French until Indian independence. Along the way, we see a man on a moped, virtually hidden by the pots he is carrying for sale, and bullocks with colorful horns, painted for the harvest festival. We talk with Jay, peppering him with questions that occur to us from time to time to try to learn more about the history and culture of this region. As we enter Ponchiderry, we see policemen, still sporting bright red caps that were worn by the French. Pondicherry is best known for Auroville, “The City of Dawn” which was established in 1968 to continue the teachings and beliefs of the Indian philosopher Sri Aurobindo who lived and worked here. Built as a utopian paradise by his disciple, Mirra Alfassa, also known as Mother, it was planned so that people could live and work here irrespective of religion, caste or nationality. More than 2000 people from some fifty countries occupy the area, the land donated and supervised by by India and the project recognized by UNESCO. 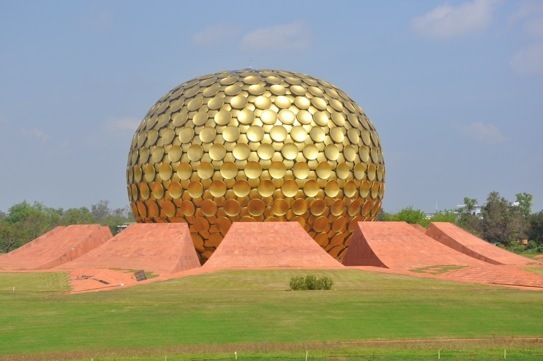 We walk about a kilometer to the most striking feature, the Matrimandir, a large, golden sphere, composed of some 4000, gold-colored disks, which houses a white marble chamber (which we are not able to enter) that is a meditation center. Inside the chamber a crystal which reflects the sun’s rays serves as a focal point to aid meditation. From Auroville, we drive to our hotel Le Dupliex, a charming French house that has been converted to a lovely hotel. Because Steve taught a student whose family owns the hotel, they are upgraded to a very large suite. Our room, though, is more than adequate. We lunch in the breezy, open courtyard of the hotel, then relax for awhile before setting out for a walk through the former French Quarter with its elegant colonial mansions, tree-lined boulevards, bars and cafes, which provide a sense of the history of the town. 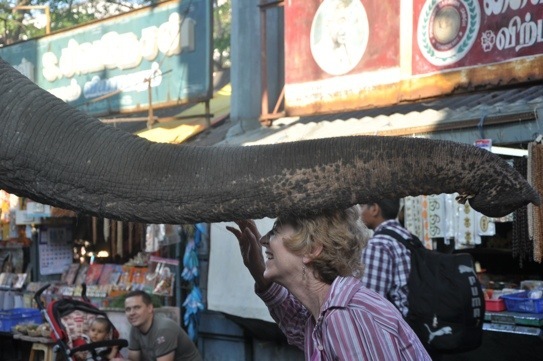 We stop and give an elephant minder a few rupees, so that the elephant will bless Carol by touching her on the head with his trunk. We walk around and stop in a rather upscale shop in which we buy some very nice scarves. We stop at an ashram, the former home of Sri Aurobindo, whose philosophy inspired Auroville. We walk through, silently and without photographing, as required. People file by the tomb of the philosopher, some bowing or praying to give homage to him, touching their heads to the flower petals that form an intricate design on the tomb. Many people sit in the room, meditating. We continue walking, past the bed used by Mother and the chair in which Sri Aurobindo used to sit. It really is quite moving, perhaps more so than our visit to Auroville. From the ashram, we walk by the sea. Large crowds of families stroll along the walk and beach, dressed in their fine clothing on this Saturday evening. 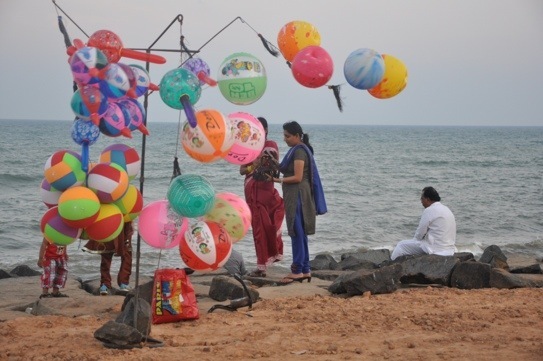 We discuss differences with Jay in our cultures, how nobody would dress up in the US to walk by the beach, and how this serves as the major source of entertainment for Indians, other than going to movies. Eating out is not common as it is in the States, and, in fact, is thought by many to signal a problem in the family. Only the rich would think of going to the theater, or a concert or dance, except for periodic festivals at temple. We return to the hotel, where Karen is waiting, having gone ahead in anticipation of receiving a call from a friend of a friend, who is a ceramicist living in Pondicherry. Karen tried, a number of times to reach her by email from the States and had tried to call before, all unsuccessfully. A last try this afternoon, managed to connect with Deborah Smith, who said she’d call later. Karen told us that Deborah was coming by in 15 minutes and wanted us to drive her by her house for a quick look. Our experience with Deborah is a testament to the virtue of (Karen’s) persistence. A Stanford graduate, she studied pottery in Japan, before moving to join Sri Aurobindo. Her now husband, Ray Meeker, a talented ceramicist and architect, joined her in Pondicherry, where they’ve lived, worked and taught for more than forty years. Their house, in the French Quarter is absolutely stunning, modern, high ceilings, large rooms and an open atrium. The house would have been more than worth the visit, but the collection of pottery they had displayed, almost all of which was done by former students, some of whom are now nationally-known potters was just fantastic. Carol and I, and the Sugarmans, we’re blown away by it, and Deborah was most gracious in spending an hour or so showing and talking to us about the collection. This was a truly unexpected delight. After, we had an excellent and very reasonably-priced dinner in a restaurant called Le Club, recommended by both Deborah and Fodor’s, half a block away from Deborah’s house, then walked the five blocks back to our hotel to retire. love these newsletters! really informative and nice pictures too!